Movies like Everest are simply made for IMAX. Taking advantage of its already impressive sound system and conveying those spectacular images onto one pretty big screen, in 3D no less, this is a film that screams to be seen purely on that format to get the most out of it. It’s certainly a visual spectacle, but is that all it has going for it? Based on real-life events, specifically the disastrous 1996 attempt by a group of climbers to reach the top of Mount Everest, the film also allows us to at the very least recognise some of the key players who would meet their fate on the highest mountain on Earth. Among them is New Zealand mountaineer and expedition group leader Rob Hall (Jason Clarke), who we first meet as he’s saying farewell to his pregnant wife Jan (Keira Knightley), American climbers Beck (Josh Brolin) and Doug (John Hawkes), and Hall’s American rival leader Scott Fischer (Jake Gyllenhaal) who later combines his own team with Hall’s in a joint effort to reach the top. They and a select few others soon become caught up in the dangerous conditions nearer the summit of Everest, and fight for survival amidst an all-consuming blizzard which, as history sadly dictates, would end up claiming the lives of many who dared to venture up there on that fateful day. If this had been a product of unoriginal writers throwing about ideas for disaster films in the wake of Gravity’s success, then it would have been an ambitious but unmemorable attempt to break through the genre, more like Twister or Dante’s Peak than Alfonso Cuarón’s Oscar-winning work. However, the fact that it is all based on true events and depicts real-life people as characters within the narrative, keeping their stories and personalities relatively close to reality, gives it more of an edge over the more atypical Hollywood natural disaster schlock. Writers Simon Beaufoy and William Nicholson understand the importance of making the audience care about what’s happening and who it’s happening to, rather than just having the visual effects and high production values take over, and their joint screenplay gives the characters the opportunity to be people we want to see succeed and get out of harm’s way. This is especially important since these people are mostly all people who truly went up Mount Everest at that time, and to represent them in ways that would perhaps be more negative than it may have been in real life would have been very disrespectful. Luckily, Beaufoy and Nicholson give them enough depth and likability in their script so that when things do happen to them, you’re genuinely on the edge of your seat in anticipation of what might happen next. Amazingly, even in a cast as large and expansive as this one, a good chunk of the actors are given enough screen time to make their appearances fairly memorable. This is very much an ensemble piece, with no particular actor standing out amongst the rest, but each cast member gives a strong performance that both honours and respects the real-life figure they’re portraying, whether they’re deceased or still living, while also exhibiting a flare for more physical acting in the (simulated) conditions of harsh snowstorms. Even actors with less to do than others, such as Emily Watson’s base camp co-ordinator or both Knightley and Robin Wright as the waiting wives of two key mountaineers, still find ways to shine with their limited material. Again, there are no real standouts since everyone seems to be on the same wavelength as one another, but as an ensemble it’s a talented group of people working well with what they’re given. The closest we do get to a standout, however, is undoubtedly with the titular character. As a gigantic spectacle, Mount Everest is absolutely breath-taking – no, really; characters need oxygen tanks as they get higher and higher – and is one that absolutely deserves both its IMAX presentation and its 3D display. Icelandic director Baltasar Kormákur, perhaps best known in the English-speaking world as the director of action-comedy 2 Guns with Mark Wahlberg and Denzel Washington, takes full advantage of the mountain’s incredible scenery to create some gorgeous shots that would feel right at home in a David Attenborough documentary, and we mean that as a compliment. His grasp of the 3D angle also makes for some extremely nerve-wracking imagery; when the camera delivers a bird’s-eye shot of the lengthy chasm beneath what’s known as the Hillary Step, it’s absolutely terrifying thanks to the depth that the technology provides. However, when the blizzard does make its way to severely disrupt things, the IMAX sound system really goes out of its way to create those vibrations that make you truly feel the sheer force of the wind these characters are facing. Honestly, we’d recommend an IMAX viewing based on this sequence alone, it’s that powerful. Make no mistake; the way it’s portrayed in this movie, Mount Everest is a pure beast of nature. Whether it will truly become a new classic amongst disaster movie aficionados remains to be seen, but Everest is certainly a strong retelling of a true-life tragedy that benefits enormously from the IMAX 3D format as well as a script that never forgets to make us care about what’s going on. Give it a watch purely on that format; it’s worth the climb. 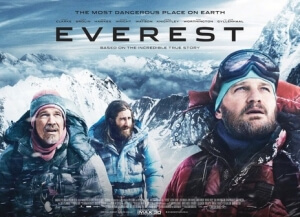 Everest is a powerfully-made retelling of the 1996 Mount Everest disaster that is made even more powerful by an emotional script, a talented cast ensemble, and especially its IMAX 3D presentation which is highly recommended viewing.